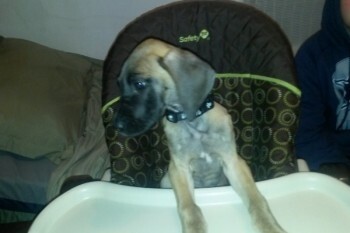 Browse > Home / Dog Advocacy, Health, Nutrition / Will You Help Great Dane Puppy Bijou Get Her Life-Changing Surgery? In the course of my travels this month, I met a man named Tim who has a Great Dane puppy in need of surgery. The little girl, named Bijou, has Persistent Right Aortic Arch and Megaesopagus, which means she has a very hard time eating. Tim has to grind up her kibble, add water, then spoon-feed her four times a day. Without surgery, the dog will likely succumb to pneumonia at some point. Tim recently lost his previous Great Dane at 9-years young. Tim has started a GoFundMe account to try to raise the over $4,000 needed to get Bijou the help she needs. Can you help? This is Bijou a 3 month old Great Dane puppy with Persistent Right Aortic Arch and Megaesopagus. The Megaesopagus may be a result of the PRAA or know as Vascular Ring Anomaly. It is a congenital anomaly of the blood vessels of the heart that result in constriction of the esophagus. And the Megaesopagus is a condition where the esophagus doesn’t get the food to the stomach. Surgical removal of the stricture (narrowing) caused by the PRAA (Persistent Right Aortic Arch) is the preferred treatment in puppies between 2-6 months of age before permanent growth damage has occurred. Without surgery she will require a special diet 4 times a day of ground food made into a slurry and will require to eat in a upright position and remain there for 45 minutes after each meal so gravity will help the food to pass to the stomach and only about half makes it there, and which most of causes aspiration pneumonia which most likely will be fatal to the dog. Treatment will require X-rays and a esophagus scan and barium scan. The classic Thoracotomy which is the opening of the chest or a Minimally Invasive Surgery which has advantages of decreased pain, reduced risk of wound complications and infection, shorter hospitalization and better visualization due to the magnified high-resolution images. The cost of the tests and surgery is between 2 and 6 thousand dollars and the M.I.S may run higher but may require minimal post-operative hospital care. There is a great website with lots of info if you want to read more on this condition. Bijou has already has minor pneumonia and is currently on antibiotics and her slurry meals until we can reach our goal to begin her road to a normal life. I want to thank you all in advance for being a part of her success. What was Removed from an Oklahoma Dog’s Stomach?